0/3 – Dirty wet dog , boats and sailing. As of today that’s 3 boats seen and 3 boats rejected…..fussy eh !. I have already mentionned the Dehler 25 in one post that we went to see in Essex and the Westerly GK29 that we saw the same day in the solent. Today we went to see a boat locally that might have had the potential at its price as a starter for a project boat and in a way it did have that potential except with lots of ‘buts’. Today i will quickly run through the rejects and give a brief explanation of why the boat was a potential, what it is that i saw in them that might have fulfilled my requirements and then why each one failed in their un-modified form. 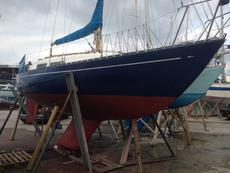 First the Dehler 25 (Red Rum). Seen ashore at Tollesbury with its trailer. The maximum trailer sailer idea for me is that its an easy boat to store, can be towed to a cruising ground fairly easily even with my own 4×4, the specific boat could creep into the kind of shallow creeks and rivers that i have explored in the Liberty but the boat does then have a bit more sailpower than the Hunter…its basically a quarter-ton IOR race boat with a lifting keel, cassette rudder and easy-drop rig. The boat was in good condition for its age and didn’t need much to put it in the water. There are some drawbacks compared say to my own boat : to get the keel up for beaching the boat takes about 250 turns on a manual winch and then needs the whole rudder cassette lifting out. The combination of those 2 things mean that the boat won’t do what i do already ie sail/motor up creeks and rivers with the board and rudder half up or down…with the Dehler its either up or down, especially the vulnerable rudder blade (the liberty’s rudder blade can be lifted up aft even when it grounds as can the centreboard. I didn’t like the interior layout and its not an easy one to modify because of the keel case so what we would end up with is a small and useless forepeak that neither of us could sleep in and a main cabin that needs changing each time we do anything : from cooking to sitting to sleeping. I really didn’t like the sliding galley arrangment especially in that the hob/sink arrangement is a one piece unit that may have been built for the boat and would be difficult to replace. It looked awkward to use as did the small chart table and i can see why some owners convert the chart table area to a small galley instead. Next i didn’t like that the engine was underneath a cockpit sole hatch : i can just imagine a big following sea flooding the cockpit and lots of that getting into the engine bay. Other things that put me off were that a lot of fittings such as the hatch and hatch boards seemed really flimsy….the companionway boards for example were a mere 6mm which i could almost put a foot through with a decent kick !.. In short the boat is a good family weekender based around a couple with young children but is neither a good ‘creek’ boat or sufficiently tough to be a ‘channel’ boat either. At is asking price of nearly £11,000 i could also have bought the full-on offshore cruising boat that we saw next. GK29 ‘Gladrags’ seen ashore at Portchester. This was a completely different concept for a boat and much more orientated towards a tough and rugged offshore boat that would be a larger long term cruising home. From the outset i knew this would be a longer term and much more expensive project due to the size and weight of new gear for example but is part of a longer term plan for a true retirement cruise boat. The type is once again something that i am familiar with as its basically a half-ton cruiser-racer under the old IOR and has a good reputation as a solid sea boat. It should have enough interior volume to allow a fixed double berth and sea berths, a proper working galley and chart area and enough stowage for long term cruising. Right from the outset i also knew that the boat would need a major keel modification ie a custom designed and cast new keel in the form of a shallow wing or bulb type…something like a scheel-keel. That would allow me to get into shallower rivers and harbours and dry the boat out more easily than balancing it on its deep fin. First look at the interior suggested a fairly typical cruising/racing boat interior of that era. It was the interior layout that really caused the fail on this one as well, for such a wide and high volume space none of it seemed to work particularly well except for the galley which was possible to stand in and work at sea. The main problem is that it felt like being inside a deep dark box with no useful view out…compared with my old Frances 26 for example where i could be cooking or working at the chart table and still have most of a 360 degree view the GK has almost no view outside from inside and that really doesn’t work with shorthanded watchkeeping. It didn’t help that the boat had a bad smell inside and that it clearly needs a thorough clean out. I did have a plan for a complete refit of the interior along similar lines to a cruising boat built by a US owner (Danny Greene ) where he did the most simple interior imaginable, difficult to explain here. Some main problems with this boat at its price is that it really needs all new sails and with its genoa-heavy rig that means 4 or 5 new sails to have what i want which is simple and hanked-on jibs. The cost of purchase + the keel modification + new sails alone puts it outside my budget plus it would need that entire interior refit. This is what i feel might be a compromise solution with a high degree of modification : the boat is just about the minimum size that 2 people can be comfortable aboard for a long period (i know a couple who live on one !) and is said to be a decent sailing boat. At this size its a lot cheaper to replace things like sails as once again this is an early example of IOR boats that are genoa heavy and really need several headsails to go well. Of the 3 boats this was the oldest, roughest and had the most problems and yet bizzarrely this is the one we liked the most. We saw the boat with its owner who has had the boat for 20 years or more and has clearly sailed it and enjoyed it. The owner was great : very honest and straight talking about the boat’s many faults, much of the gear is old and needs replacement for example. What i had in mind here was a starter boat for a total rebuild/refit during which i would strip the boat down to almost a bare hull, rebuild the interior, possibly re-rig and give the whole boat a much needed cosmetic re-do which it really needs. At its asking price that is almost do-able except that it needs lots of new gear but mainly that it needs lots of time and sweat equity. To do the boat justice i reckon it needs a total budget of around £15.000 from my ‘back of fag-packet’ estimate and the problem then is that you end up with a £15.000 boat that’s worth about 5 or 6k and that doesn’t make sense. The answer is first a regreful no as we both liked the boat but maybe to go see other similar but younger and less problematical boats. That’s the really sensible options covered so far. Comments : Peter Cash wrote “I recall the Danny Greene boat, modular interior that all came out through the hatch. We were finishing our 31′ steel yawl at the time, but went for a more trad look and build. His layout was simple but did not fit our family plans with kids. My wife wanted a full galley and private head and a kiddy cabin. The worked ok though at 6′ would not fit now.. The DG article in Cruising world (mid 80’s?) was passed on to a friend who is still builing his project after 15 years. He is rapidly aging so l hope he gets it done soon, another five years and it may be too late. We quickly finished the interior enough to use, then splashed her for fitting out, kind of a weekend floating cottage for the first season. That was 20 years ago. Good life lesson, hope my friend learns it in time. So endeth the lesson. Ah yes that’s the boat : i had that in a book about yacht interiors….that was how i wanted to do the GK29 if i had the budget to do it. I recall the Danny Greene boat, modular interior that all came out through the hatch. We were finishing our 31′ steel yawl at the time, but went for a more trad look and build. His layout was simple but did not fit our family plans with kids. My wife wanted a full galley and private head and a kiddy cabin. The worked ok though at 6′ would not fit now..